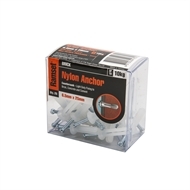 This Ramset Nylon countersunk Anchor is removable, light duty and suitable for use in a variety of substrates such as concrete, stone, solid brick, solid block, hollow brick, hollow block and hollow slab. Quick and easy to install and remove. Garage How to build a carport Find out everything you need to do before you start building a carport to make sure it’s legal and safe. Outdoor Living D.I.Y. outdoor pallet coffee table on wheels Learn how you can turn an old pallet into a rustic outdoor coffee table on wheels. Gates & Fencing How to build a picket gate A picket gate can give you extra privacy and security. Learn how easy it is to build a picket gate with our easy to follow step-by-step instructions. Outdoor Living How to make a D.I.Y. outdoor storage bench seat This stylish bench seat will not only give you somewhere to sit and admire your garden, it also provides some handy storage space. Bedroom How to build a three drawer floor cupboard Great for extra storage in your office, kitchen or laundry, we’ll show you how easy it is to build a three drawer, floor cupboard.